NDO/VNA - The visits to Laos and Cambodia by Party General Secretary and President Nguyen Phu Trong are important external activities which have profound meaning in the relationship between Vietnam and the neighbouring countries, said head of the Communist Party of Vietnam Central Committee’s Commission for External Relations Hoang Binh Quan. 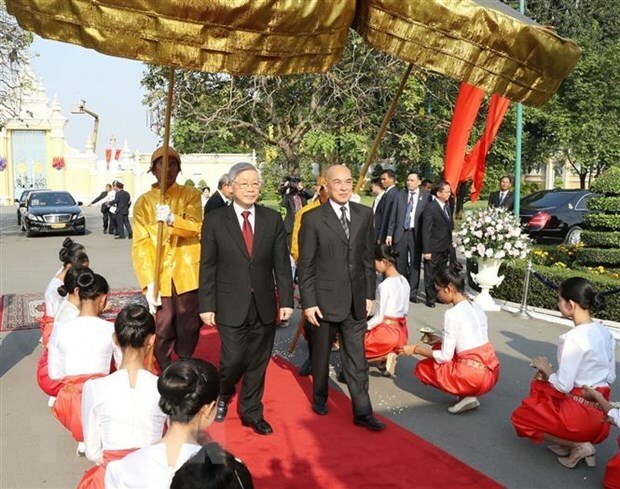 The selection of Laos and Cambodia as destinations for his first visit in his position as new General Secretary and President of Vietnam is to affirm the consistent policy of the Vietnamese Party and State in the relations with the two nations. The visits are very successful as the sides reached important agreements, according to Quan. They affirmed the high appreciation and determination of the three countries’ leaders in constantly strengthening special political trust; and fostering solidarity, friendship and comprehensive cooperation between Vietnam and Laos and Cambodia. Talks, meetings, as well as the joint statements deeply reflected the long-term strategic vision and high determination to make the Vietnam-Laos and Vietnam-Cambodia relations become more dynamic, practical and effective. Vietnamese and Lao leaders agreed to promote comprehensive cooperation, while giving priority to each other in accordance with the nature of the special relations and great friendship between the two nations. Many measures and major orientations were proposed for each field of cooperation. The two sides’ leaders emphasised the need to economic, trade and investment cooperation, as well as their connection in transportation, electricity and telecommunications development. Meanwhile, Vietnamese and Cambodian leaders of the countries agreed to continue strengthening political trust between the two parties and the two countries through regular meetings and contacts in various forms; coordinating to maintain and improve the effectiveness and practicality of bilateral cooperation mechanisms. They attached great importance to promoting the connection between the two economies towards sustainable and long-term development on the principle of mutual assistance and benefit. The two sides pledged to continue cooperating closely and effectively in defense-security, considering this an important pillar in their bilateral cooperation. They agreed to finalise the signing of legal documents to record the completion of 84% of their demarcation and border marker planting workload on land, seek solutions in accordance with international law and practice to soon complete the remaining work, and work closely to fight arguments and actions to take advantage of border issues to undermine the Vietnam-Cambodia relations. Leaders of Vietnam, Laos and Cambodia discussed substantially to promote common perceptions on the need to exchange information, closely coordinate and provide mutual support in international and regional issues at multilateral forums, especially within the framework of ASEAN, the UN and the Mekong Sub-regional cooperation mechanisms. They emphasised the importance of maintaining peace, stability, security and safety in the East Sea, and supported ASEAN's role and principles. They agreed to promote the settlement of disputes in the sea by peaceful measures based on international law, including the 1982 UN Convention on the Law of the Sea (UNCLOS), and work with relevant parties to fully and effectively implement the Declaration on the Conduct of Parties in the East Sea (DOC) and soon reach a Code of Conduct in the East Sea (COC). Both Laos and Cambodia support Vietnam’s candidacy as a non-permanent member of the UN Security Council for the 2020-2021 tenure and the chair of ASEAN Chair in 2020, Quan said.